There are many reports about the potential hazards of wood dust, but people are taking a long while to really understand that the potential risk also applies to them. 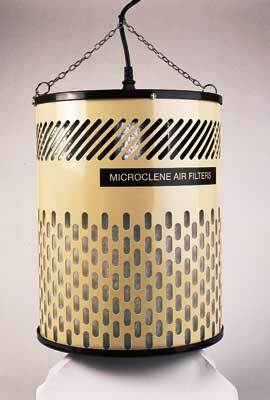 One company, Acrol UK Ltd, which manufactures Microclene ambient air filters, has come a long way since the introduction of the MC400, a drum-type filtration unit which is suspended from a ceiling. It soon become apparent to the manufacturers that one type of unit could not possibly cater for every situation. Let's face it, there are carvers, turners, joiners and cabinetmakers with different-sized workshops, equipment and working practices so their conclusion will be no surprise to woodworkers. The upshot is that there are now quite a few styles available to suit varying needs. All demonstrate high build quality, with robust metal casings that will take a lot of abuse. I was sent two types: the MC1200 which is a drum type that, like its smaller predecessor, is suspended from a wall; and the MC500, a box type that can be wall, ceiling or bench mounted. 6 x 8 x 2.5m - I wish my workshop were this size - being filtered 10 times per hour. When the unit arrived I had to fit the suspension chain and site the unit. I put a ceiling hook into a ceiling joist about 1.5m behind the lathe, so that it would extract the dust away from me. 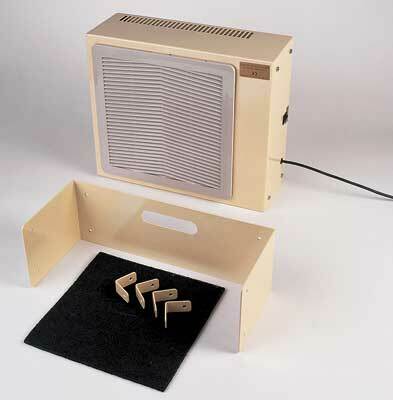 The detachable power cable connected into a socket in the top of the unit and was about 1.5m long. I had a wall socket nearby, but if the MC1200 is sited too far from a socket an extension lead may be required. Once it was connected to the socket and switched on, it twitched on its mounting and purred into life, though 'purr' is probably the wrong word - at 70 decibels at 1.5m, the sound is more like a constant whooshing wind across a window on a winter's day. It's not so loud that you cannot hear a radio as you work, but it is enough to be aware of. After the first five minutes or so, however, I didn't notice it anymore, but was aware of the lack of noise when the unit was switched off. I immediately put it to the test by sanding two bowls, one yew and one mahogany, so that the filter would show a different colour if it worked. To access the filter, a small machine screw on the bottom of the unit is undone to facilitate the removal of the metal base plate. This in turn allows the user to pull the filter out when replacing it. The filter had turned from an off white to a dull brown. It had worked. The downside to the MC1200 is that it is located in one position and this is not always near where I would be working. However, it would continually work at filtering the air in the workshop. The MC500 is smaller than the MC1200 and filters, wait for it, 500cu m of air an hour. At last there is a manufacturer who uses easily understood codes for its products. Anyway, this unit is capable of being fixed in one position, but more importantly it is light enough and small enough to be moved around the workshop as required. So I placed it, free standing at the back of the bench and power carved. Being only 0.5m away from the project, the fine dust was whisked away. The other clever thing about this unit is that it is twin speed. The boost unit really does boost the extraction power and is very effective, but is not necessary all the time. When used on boost, this unit is quieter than the MC1200 but not by much - 64 decibels at 1.5m. But it is very quiet on the 'lower' setting. I also tried it behind a lathe on boost and also fitted the optional carbon filter prior to finishing a large piece of work with a pre-catalysed melamine finish. This finish has a strong 'pear drops' smell that in a confined space, I feel, makes someone light- headed after 10 minutes or so if the odour is not exhausted somehow. Not all of us have that facility, so this filter has been designed to filter out the smell, and very effective it was too. I cannot say that it filtered out all the smell, but there was a very noticeable reduction in the smell when the unit was on boost. Because the carbon filter is dark grey/black, it cannot be mistaken for an ordinary filter. This optional filter is Â£6 so is not going to break the bank. The filters are quick to change: simply lift off the front white grille and swap them over. Both units are highly effective and in my opinion cost effective. I switched off the main lights in the workshop and shone a halogen lamp across the work area after sanding with the filter units off and also when they were on to see what dust motes were in the air. I found that there was a significant difference. These filters will not do away with the need for a vacuum-type extractor for the larger chips and to collect the dust emitting directly from bandsaws, routers, jigsaws and so on. And when using machinery or undertaking operations that will create lots of fine dust, they will not obviate the need for personal protective equipment such as a high-quality dust mask or, better still, a respirator. They will, however, filter the air in the workshop quite a few times an hour, depending on the workshop size and the unit chosen, giving another line of dust defence. I am a convert - so much so that I bought the units. "I am a convert - so much so that I bought the units"